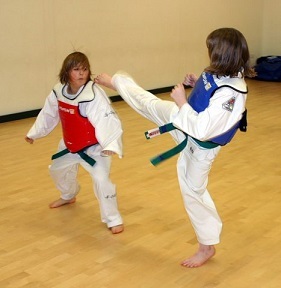 (TKD) is a Community Amateur Sports Club (HM Revenue Ref.CASC 04538) that is run for the benefit of its members. All of the instructors give their time freely and the club aims to keep lesson fees to a minimum. Powerhouse TKD is part of Tae Kwon Do Chung Do Kwan Great Britain and British TaeKwonDo (BT). The club and the association aim to provide members with a means to enjoy, and benefit from, learning and practising the Korean martial art Tae Kwon Do. This literally means the way of kicking and punching, but there is a lot more to Tae Kwon Do than that! We are a hampshire based Tae Kwon Club, with TKD in Swanmore and TKD in Havant. We would love for you to try TKD and offer the first lesson free of charge! TKD is a traditional martial art, an exciting Olympic sport and a way of gaining overall bodily fitness. The combination of traditional knowledge focused on modern aims make it a fun and interesting fitness activity, and offers a system for achieving strength and unity of body, mind and spirit. 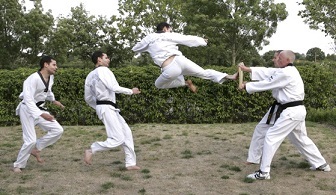 It has two major forms the older International Tae Kwon Do Federation, and the World Tae Kwon Do Federation, which is the form practiced by the Powerhouse club, and is also the Olympic discipline. TKD is for everyone not just those who want to compete! Practicing the basic techniques develops muscular strength and also improves balance and co-ordination. Moving onto combinations and sparring requires both aerobic and anaerobic fitness, whilst learning and performing patterns builds up concentration. Flexibility is improved through both static and dynamic stretching, which features highly in the warm-up and cool-down phase of classes. 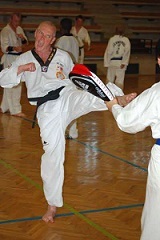 It is not necessary to be super supple or highly robust physically to perform TKD, it is mastering correct technique that is important, though the training will naturally develop the physical and mental attributes according to one's own abilities. Throughout Chung Do Kwan TKD emphasis is placed on developing self-control and improving individual determination. Most of all TKD is a natural way of developing your body and mind, which makes it an interesting and fun way of keeping fit. TKD is for everyone. It does not matter if you're eight or eighty, an international athlete, or a reformed couch potato, anyone who wants to try and is prepared to persevere will benefit and enjoy Tae Kwon Do. In the Powerhouse TKD we have a complete spectrum of ages, abilities and experience, who enjoy training together. Of course children can't do or learn in quite the same way as adults and again veterans also can't expect to do everything in the same way as the youngsters, but everyone can learn the basic techniques, and derive enjoyment in improving and applying them as is appropriate. Also everyone benefits from a little fitness and flexibility training, especially when it is conducted in a friendly and fun manner.